Container of keys of an identity. The container is used to search/enumerate keys of an identity. The container can be created only by detail::IdentityImpl. Definition at line 48 of file key-container.hpp. Definition at line 87 of file key-container.hpp. Definition at line 92 of file key-container.cpp. Definition at line 98 of file key-container.cpp. Definition at line 104 of file key-container.cpp. Definition at line 110 of file key-container.cpp. Add key of keyLen bytes with keyName into the container. If a key with the same name already exists, overwrite the key. Definition at line 116 of file key-container.cpp. References ndn::security::v2::extractIdentityFromKeyName(), get(), and ndn::Name::toUri(). Remove a key with keyName from the container. Definition at line 130 of file key-container.cpp. Get a key with keyName from the container. Definition at line 143 of file key-container.cpp. 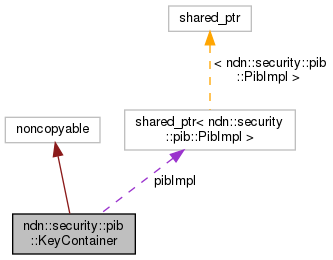 Referenced by add(), ndn::security::pib::detail::IdentityImpl::getDefaultKey(), ndn::security::pib::detail::IdentityImpl::getKey(), and ndn::security::pib::detail::IdentityImpl::setDefaultKey(). Definition at line 165 of file key-container.cpp. Referenced by ndn::security::pib::detail::IdentityImpl::addKey(), ndn::security::pib::detail::IdentityImpl::getDefaultKey(), ndn::security::pib::detail::IdentityImpl::getKey(), ndn::security::pib::detail::IdentityImpl::getKeys(), ndn::security::pib::detail::IdentityImpl::removeKey(), and ndn::security::pib::detail::IdentityImpl::setDefaultKey(). Definition at line 142 of file key-container.hpp. Definition at line 148 of file key-container.hpp. Definition at line 161 of file key-container.hpp. Definition at line 139 of file key-container.hpp.